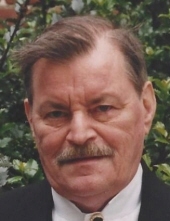 MCALEER, Charles "Mac" -Age 82, of Grand Blanc, died Monday April 3, 2019. No services will be held at this time. Mac was born May 12, 1936 the son of William and Margaret (Cousins) McAleer in Detroit. He grew up in Dearborn and graduated from Dearborn High School. He began working for General Motors at the Cadillac Plant in Detroit in 1971. Later he was moved to the Metal Fabrication plant in Grand Blanc where he spent the rest of his career, retiring in 2001. Mac enjoyed watching football and was a very simple and frugal man. To send flowers or a remembrance gift to the family of Charles "Mac" McAleer, please visit our Tribute Store. "Email Address" would like to share the life celebration of Charles "Mac" McAleer. Click on the "link" to go to share a favorite memory or leave a condolence message for the family.